The Sonnen group investigates how signalling pathway dynamics encode information to control development and homeostasis of multicellular systems. Figure 1: Transmitting biological information with signalling dynamics. Information can be encoded in the dynamics of a signalling pathway, for instance in oscillations. The signal can be decoded by reading out the signal in a static (e.g. absolute level at the timepoint highlighted with dashed line) or a dynamic manner. Signalling pathways are inherently dynamic, they change in activity over time. Recent studies have indicated that biological information can be encoded in these dynamics (Figure 1). 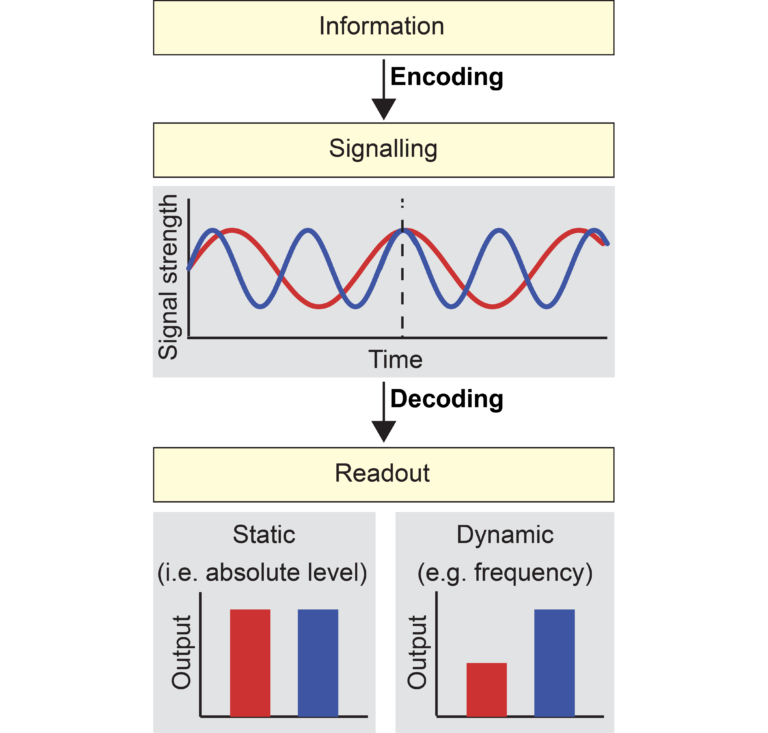 This so-called “dynamic signal encoding” can have multiple advantages for cells, such as increasing the versatility of signalling pathways, robustness to noise and orchestration of repetitive events (reviewed in Sonnen and Aulehla 2014). Our work aims at understanding the function and the mechanism of dynamic signal encoding in multicellular systems, both during embryonic development and tissue homeostasis. Figure 2: Investigation of dynamic signal encoding in multicellular systems. 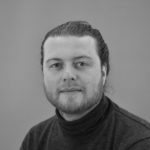 The Sonnen group studies how information is encoded in signalling dynamics and how this controls cell fate decisions during development and homeostasis of adult tissues. 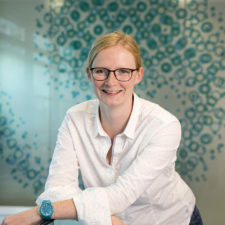 We take a multidisciplinary, quantitative approach combining developmental biology, biochemistry and cell biology with quantitative tools (such as real-time imaging of dynamic signalling reporters and spatiotemporal perturbations of signalling pathways using microfluidics) to investigate the function of dynamic signalling and the mechanism of dynamic signal encoding at tissue-wide, cellular and molecular levels. 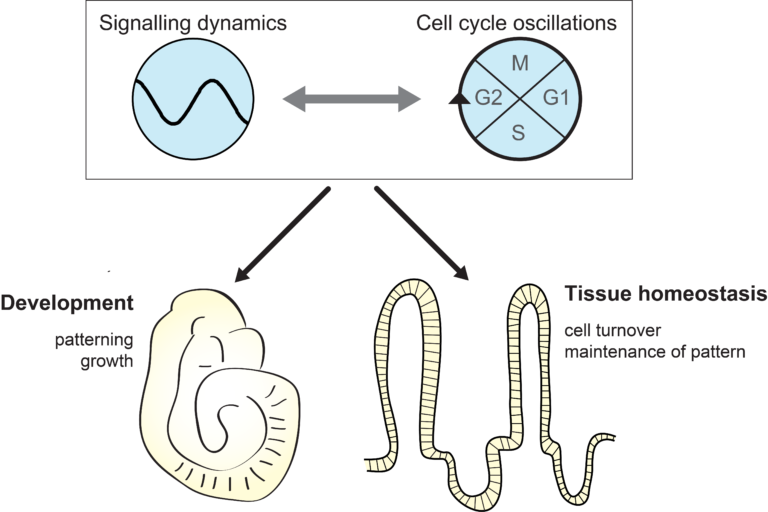 How do signalling dynamics control growth and patterning during embryonic development? How do signalling dynamics affect cell turnover and differentiation during homeostasis of adult tissues? For functional dissection of dynamic signal encoding, we have to subtly modulate the dynamics without altering the overall signalling activity and study the effect of such a perturbation. To enable this on multicellular level, we have established a microfluidic system, with which signalling dynamics can be controlled using external pathway modulators with high temporal precision. This setup allows, for instance, to manipulate the period of signalling oscillations and to control the phase-relationship between multiple oscillatory signalling pathways (Figure 3) (Sonnen et al. 2018). We also adapt this system to perform perturbations with high spatial as well as temporal precision. Figure 4: Mouse somitogenesis is the periodic segmentation of a growing tissue. 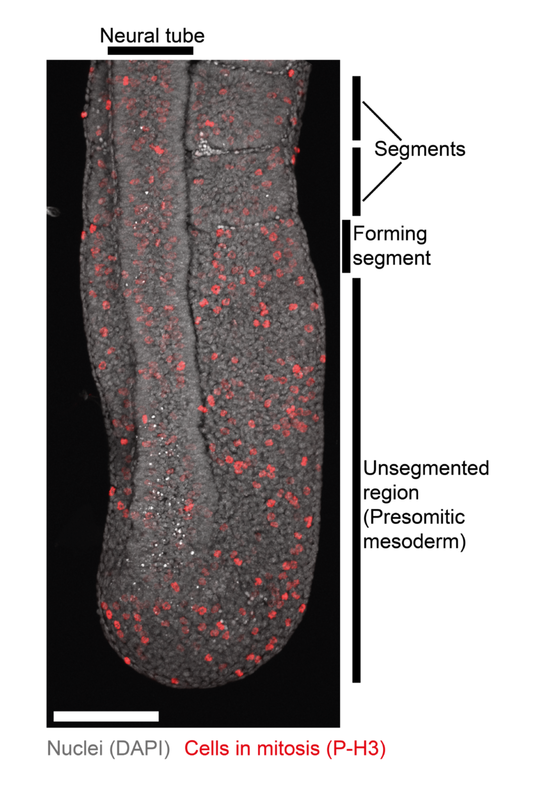 While the influence of signalling pathways on segmentation and patterning has been studied for decades, the control of cell proliferation within segmenting presomitic mesoderm is not understood in detail. We use mouse somitogenesis as model system for the study of signalling dynamics during development. Somitogenesis is the periodic formation of segments or somites that give rise to e.g. vertebrae and axial muscles. Sequential segmentation of the presomitic mesoderm (PSM) is controlled by both signalling gradients and oscillations. Oscillatory Notch, Wnt and FGF signalling constitute the so-called “segmentation clock” and determine the timing of the periodic segmentation (see video below). We have shown previously that critical information for periodic segmentation of the PSM is encoded in the relative timing of Wnt and Notch signalling oscillations (Sonnen et al. 2018). We aim to understand the molecular mechanism of how Wnt, Notch and FGF signalling pathways are linked and control the periodic segmentation of the PSM. We also address how signalling pathway oscillations interact with other oscillatory systems, i.e. the cell cycle machinery (Figure 4). This will advance our understanding of the coordination of growth and patterning during development (Figure 2). 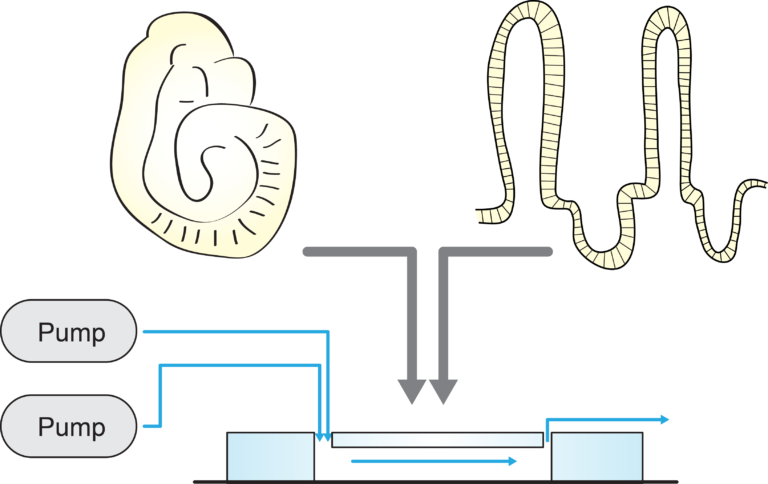 Figure 5: Visualization of Wnt signalling activity in organoids of the mouse small intestine. Paneth cells (labelled with asterisks) provide Wnt protein to induce Wnt signalling in neighbouring cells, which can be visualized using a dynamic Wnt signalling reporter. Dynamic signalling has been identified in single-cell cultures, but also in selected multicellular systems. Signalling pathways are known to control cell-turnover and differentiation during tissue homeostasis to constantly renew most adult tissues. 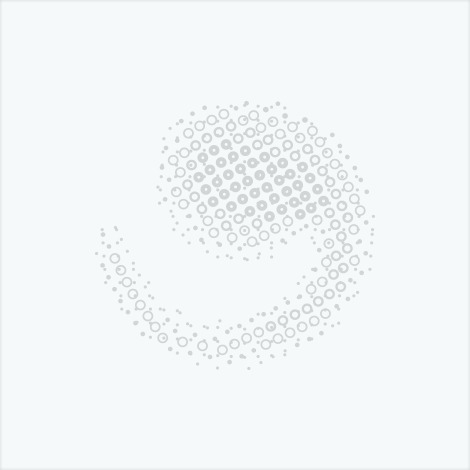 However, the function of dynamic signal encoding in these processes is still largely unknown. The recent establishment of “organoid” cultures has enabled the ex vivo cultivation of adult tissues. We combine organoid culture with dynamic signalling reporters (Figure 5), real-time imaging and dynamic manipulation using microfluidics to investigate signalling pathways governing cell turnover and differentiation at a dynamic and quantitative level. This project will give insights into how universal dynamic signal encoding is in adult tissue and tissue homeostasis (Figure 2). 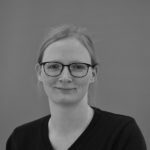 Katharina Sonnen is group leader at the Hubrecht Institute. 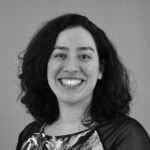 Her group studies how biological information is robustly transmitted via signalling pathway dynamics in multicellular systems. They focus on the role of signalling pathway dynamics (1) during development using mouse somitogenesis as model system and (2) during tissue homeostasis using intestinal organoids as model system. The Sonnen group uses techniques to perturb and quantitatively analyse the dynamics of signalling pathways. They have established a microfluidic system to dynamically modulate intercellular signalling in multicellular systems. In addition, they complement those tools with biochemical and cell biological techniques to unravel the mechanism of dynamic signal encoding at the molecular level.